It has been quiet around here lately. Well, because I have been working on a „secret“ project: A quilt to be gifted to the second born of my good friend. I have finished this quilt in the last days and after finally sending it to her, I am now able to tell you the story and show you some pictures. I asked her some month ago, if she would cherish a baby quilt and in case which style and color she would prefer. 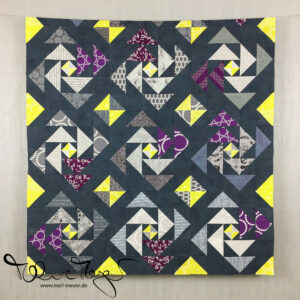 This may sound strange to you, but here in Germany quilts are not yet that common and known. I did not want to make something and have it land in a closed. Yes, she would. It should be a blanket size to cuddle that could fit on the crib as a day cover as well. Simples squares would be fine and the colors should be green and blue. The backing fabric is a blue car themed fabric which I thought would be great for this baby boy. The quilting is straight and on both sides of each seam. The binding is a black-and-white striped fabric. I have sewn the binding on by machine and since this is just my second finish, I missed in some places. So to be on the safe side — really far on it — I sewed over it again so it has been sewed on twice in most places and will hopefully hold till the boy is a grown up. I even added a small label and made a tag with washing instructions — can you tell I am really proud? 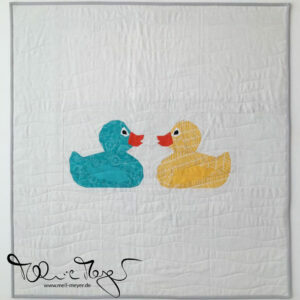 What an adorable baby boy quilt! Love the fabrics you chose and I especially love the striped binding! Wow – I love this finish, looks like great work! Amazing colors! 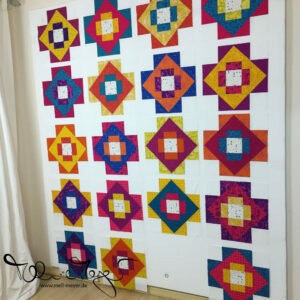 I had never thought about double sewing the binding – great idea!